Anime fans rejoice, the two biggest English-translated anime providers are teaming up to your benefit. 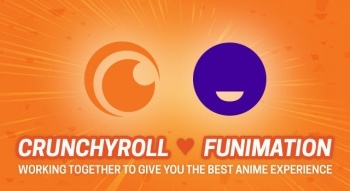 If you're an anime fan, you've no doubt heard of Crunchyroll - the biggest independent anime streaming service, and Funimation - the largest North American licencor and distributor of anime. Well today I've got some really good news: the two companies are teaming up to bring as much anime to as many people as possible! What does this mean? Well, Starting on Thursday, Crunchyroll viewers can watch subtitled versions of Funimation's summer simulcast titles, including: D.Gray-man Hallow, First Love Monster, and Puzzle & Dragons X. Additionally, some absolute anime classics that Funimation has in its catalog, like Cowboy Bebop and Psycho-Pass are available right now on Crunchyroll. On the other end, FunimationNow viewers will be able to watch Broadcast Dubs of some of Crunchyroll's summer simulcast titles like 91 Days, Mob Psycho 100, and Orange. Gen Fukunaga, CEO and president of Funimation, told Anime News Network that the decision about which of Crunchyroll's titles will get an English dub is "primarily being driven by Funimation," but that the two companies meet every week to talk about titles. Lastly, Funimation will be handling the distribution for Crunchyroll's burgeoning home video release titles and EST (electronic sell-through) releases. "The problem is, the market was fragmenting up a bit - you had other players coming in, [like] Amazon [and] Hulu ... The issue with some of those big players is that they're maybe not as concerned with the fan experience as Crunchyroll and Funimation," Fukunaga explained. "working together ... [Funimation and Crunchyroll] can provide a better experience ... that really works for the fans." It's a good day to be an anime fan!